Anyone who knows me, knows I'm a bit of a router fanatic especially where anything new or different is concerned. 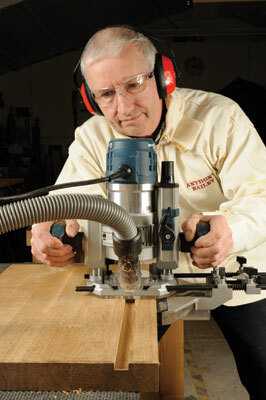 So it was with great interest that I received the new Bosch GOF 1600 CE for testing. It still looks like it is out of the Bosch stable and it shares fence and guidebushes with other machines in the lineup, but it is marked out by some very artful design engineering. For a start it is one of several combination body models that have made their way across 'the pond' from the USA to the UK, part of a reviving interest in swap-body models which give you the option of plunge- or fixed-base routing. This machine has a rating of 1,600W but stands easily as big as a 2,000W model. The â'motor can' has a rubber flat top so you can invert it for cutter-changing and a neatly but easily accessed speed dial at the front with an ample mains lead. 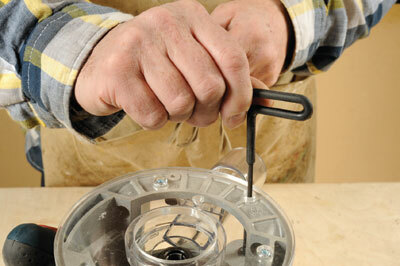 It comes with standard Bosch collets and a small but easy-press spindle lock button. It is heavy to lift in and out of both bases and has guide slots to locate it and three detents that allow it to be locked at different positions. Now the clever bit. Each base features an identical squeeze- and button-lock on-off switch on the ergonomically rubberised, right hand grip handle. The power is delivered to the switch and back to the motor can via discrete contacts in insulated tracks on the motor can, which engage with contacts in each base. Clever and apparently completely safe in operation and reliable too. Lastly there are LED worklights to see what you are doing. In Europe we are used to plunge routing and this base is better than previous Bosches in a number of respects. The plunge action is virtually waggle-free and has a very springy well-shaped plunge lock lever. Having locked it, a fine adjuster allows very precise depth setting with a clear scale around it. This being an early model, I did not have the plug-in extension handle, which makes this far easier than the one on the machine. Thankfully though, I just happened to have one lying around in the workshop. The depth rod at the front is still quite slim but unlike older designs it doesn't waggle or fall out as it sits in a plastic sleeve and sets easily against a clear metric scale. The seven stage depth turret is still present. The base is a large circular shape with one flat side for running against a straight edge and it takes a large standard fence with very usable fine adjustment on the fence. The fence knobs are apparently not supplied with anti-vibration springs. The base is smooth without dust traps which is a plus. It has a clear plastic base facing and a dust bowl can be fitted to it with another one on the fence for bearing-guided and edge work. 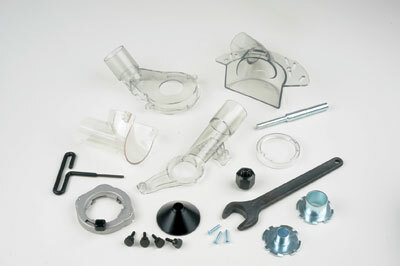 A guidebush holder can be screwed into the baseplate and standard Bosch pattern guidebushes used. A lever lock and separate safety catch allow the motor can to be fitted in to the plunge base. Although it adds cost, having a separate fixed-base brings a couple of advantages. One, it means 'divot-free' routing because there is no 'plunge bounce' which often leaves a machining mark on first plunging. This is okay if you can enter the work from one end such as making a slot or rebate. 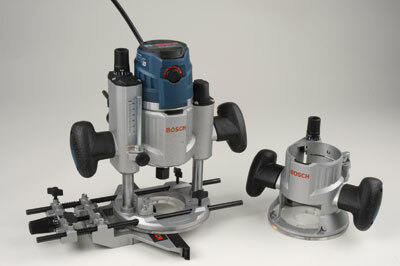 The second advantage which Bosch has picked up on, is that you can install the base under a router table. 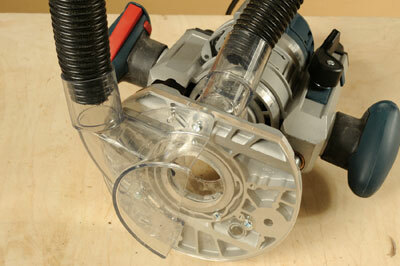 To do this you need to remove the clear base facing and use longer machine screws to mount it. 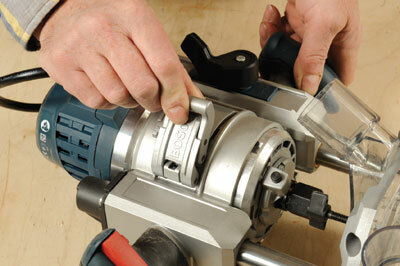 A special T-handle is supplied for adjusting the cutter height through a very small hole in the table. Fitting the motor can is similar to the plunge base except there is a paddle lever to be depressed before the motor can be slid in or removed. Bearing in mind there is a body lock lever and a safety catch, there is a bit of juggling but it works and you can choose one of three basic height settings for the motor can before using the fine adjustment. There is an identical on-off switch trigger to the plunge base and it also accepts the dust bowl too. Plenty of power is available even at 1,600W and rapid speed changes are possible when you turn the thumb wheel. It is a good tempered machine and very versatile. 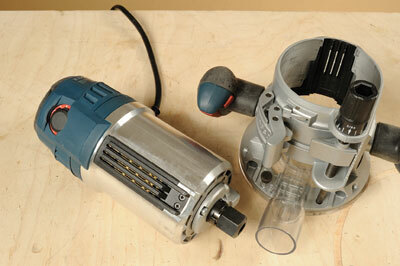 Dust extraction is much better than average if you are doing edge work thanks to the fence and base dustbowls. Apart from the heavy motor can and having to slide it in and out on body changeover, there is little, if anything, to criticise. A very well sorted machine and a credit to Bosch's design engineers.